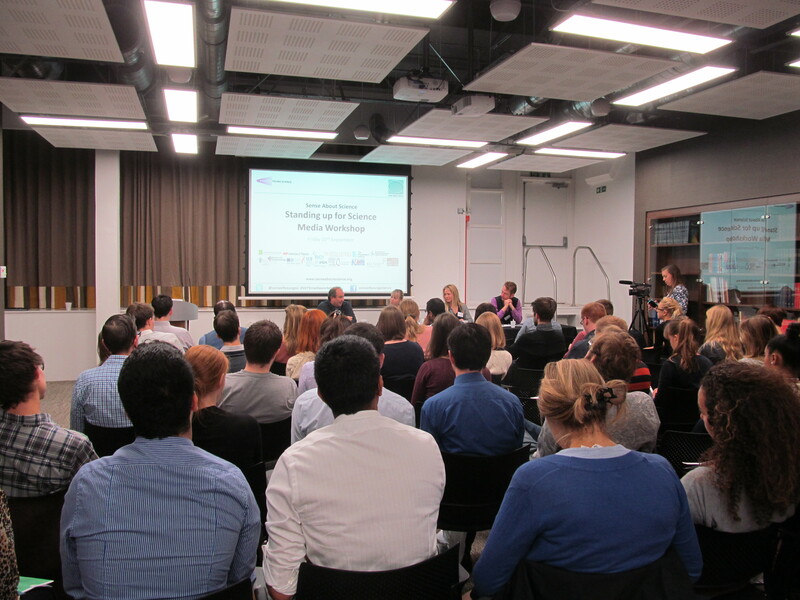 I recently attended a Standing up for Science Media Workshop run by the Sense about Science charity. The aim of these workshops is to encourage young scientists to get involved with communicating science so that we can help improve the understanding of science amongst the general public and challenge misconceptions. The day was organised into three sessions, each with three panellists who introduced themselves before taking questions from the audience. In this session the panel of scientists shared their experiences of communicating with the media. In general these experiences had been good, which was reassuring, and they had some interesting anecdotes and pieces of advice for the group. Before any interview with a journalist think about your core message. In the interview: stick to it and don’t ramble. Although they may seem scarier, live radio/TV interviews actually give you more control than recorded ones. In recorded interviews producers can cut or rearrange what you say to fit in with their story. Remember: most journalists aren’t out to trap you! Journalists work to tight deadlines. For news articles this could be a few hours so if they contact you they will want a quick response. Even if a journalist has a scientific background they are not a specialist in your area so won’t mind if you take them through “from the basics”. Once a journalist has submitted an article they lose control of it. Editors can alter the article and change the headline, so the article that gets published may not be exactly what the journalist originally wrote. The final session was a chance to discuss our concerns/barriers against standing up for science with panellists from a university press office, Sense About Science and the Voice of Young Science (VOYS) network. Sense About Science: the charity runs a number of projects including: Ask for Evidence and the Voice of Young Science Network. Science writing: Blogging, university magazines etc. Outreach: running events with school children or your local community. I really enjoyed the mix of panel sessions and group work in the workshop and would recommend the workshop to other early career scientists. For more information about future workshops visit the Sense about Science website. Nice review of the day. I think your point about journalists working to tight deadlines is a good one. It would be wise to have a short and punchy message for them.